Talent-Evaluators (aka Employers): Professionals involved in their firm’s recruiting and hiring process. This group responded to questions about how they search for and evaluate potential employees. Candidates: Professionals rarely involved in the recruiting process. This group responded to questions about how they search for and evaluate potential career opportunities. 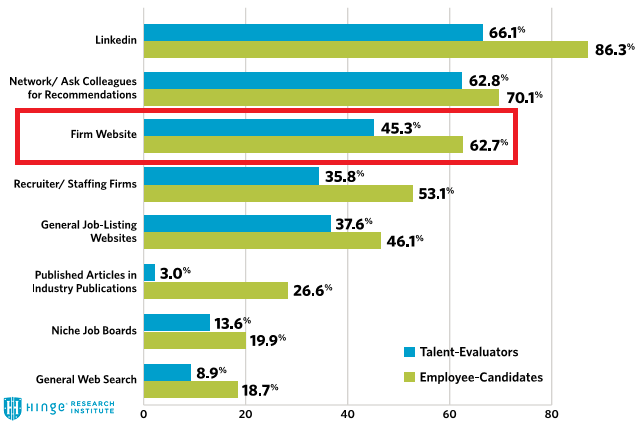 The graphic below shows survey results of the top channels employee-candidates use during their job search (blue bar) compared with the top channels talent-evaluators (green bar)) think candidates are looking for jobs on. You see the clear disconnect between employee-candidates and talent-evaluators in the percentage differentials for each job search channel. Out of those top 3 channels, your company career site is the thing you as an employer have the most control over. Ongig cares about this because we help companies optimize their company career site including job search, job descriptions and candidate experience.